The latest post in our blog series discussing the prominence of industrial sewing thread in the manufacturing of outdoor sports equipment (specifically for American football) touched on key areas of consideration when choosing thread for the production of gear such as nets, tarps, mats and more. In this post, we’ll shed some light on the reasons manufacturers and field managers choose industrial thread for the installation of synthetic turf. Over the years, demand has grown significantly for athletic and recreation sports fields to convert to synthetic turf / artificial grass. In fact, there are now more than 8,000 multi-use synthetic turf sports fields in North American schools, colleges, parks and professional sports stadiums. More than half of all NFL teams play their games on synthetic turf and more than 70 FIFA U-17 and U-20 World Cup matches have been played on synthetic turf soccer fields. Additionally, artificial turf for landscape, golf and other recreation applications is the fastest growing segment of the synthetic turf market. There has been much debate within the synthetic turf industry regarding the best methods for installation – specifically sewing vs. gluing. Both installation methods have positive advantages and the best option depends on your specific application and needs. As a manufacturer of industrial sewing thread and one of the main providers of thread for synthetic turf installation, we focus on producing exceptional material options. Below, we’ve listed some of the most important reasons to choose industrial sewing thread for the installation of synthetic turf. A synthetic turf field may have a higher upfront cost than a natural field, but over time, it proves to be a highly cost-effective investment for schools, community centers and athletic organizations. With installation, costs can vary depending on turf, cost of labor and supplies. Sewing has a lower cost in regard to materials and typically a higher installation cost for labor and equipment. However, the quality, maintenance and longevity of sewn seams will result in cost savings over time. One of the great benefits of sewing seams for artificial turf installation is that weather rarely affects installation and it can be used immediately. In extreme temperatures, glue can expand and contract making it difficult to perform a synthetic turf installation with glued seams. Additionally, when sewing seams, you don’t have to waste a full day waiting for a field to cure. The field can immediately be worked, walked, and driven on. In many ways, synthetic turf has a positive impact on the environment. Depending on location, a typical grass sports field requires between 500,000 to a million gallons of water or more each year. Tax credits and rebates are offered to residential and corporate users by an increasing number of local governments in light of the tremendous impact on water conservation. Using industrial sewing thread for the installation of artificial turf is a way to take the positive environmental impact to another level. By eliminating or limiting the use of toxic glue adhesive and sewing seams with high quality industrial thread, the result will be an environmentally-friendly and durable solution. Seam failure is one of the most common issues related to fields. When glue is used, the adhesion where the panels come together can wear away and separate – allowing the panels to shift. This shift presents an opportunity for the infill to displace and cause the field to be unsafe. 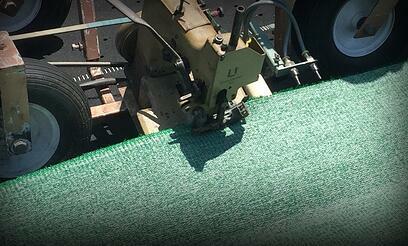 Sewing turf seams will keep panels firmly in place while preventing infill erosion and displacement. Are you considering industrial sewing thread for your next synthetic turf installation project? Learn how Service Thread can help.